As two of Asia’s leading economies, Japan and Hong Kong have much in common. Now, Hong Kong’s profile in Japan is set to rise further with a series of events during the upcoming Hong Kong Week (Oct. 29 to Nov. 11). To tie in with the first official visit to Japan of Chief Executive of the Hong Kong Special Administrative Region Carrie Lam, Hong Kong Week showcases multiple aspects of the city, including business, tourism and the arts. 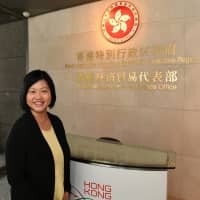 Principal Representative of the Hong Kong Economic and Trade Office (HKETO) in Tokyo Shirley Yung sat down with The Japan Times to share more information about these events, as well as her thoughts on the relationship between Hong Kong and Japan. Now in the third year of her current role, Yung says she has long been a big fan of Japan. After multiple visits mostly for leisure, she was delighted to be offered the chance to represent Hong Kong here. “It was a good match for me personally and professionally. I feel that we have many common bonds, so there was already a lot here to build on,” she said. In fact, Japan’s care for its traditional culture is one of her favorite aspects of life here. “I admire the way the people respect their heritage and various aspects of their traditions — not just buildings, but the soft culture such as kabuki, the tea ceremony, crafts and festivals,” she said. Hong Kong Week will feature a seminar entitled “Womenomics in Action: Female Empowerment and Women in Leadership” on Oct. 31. “It is organized by the Economist Corporate Network with sponsorship from HKETO, and will discuss the untapped economic potential of women in Asia and Japan, and how we can take action to leverage this,” said Yung. She points out that the theme of female empowerment is a very timely one. Lam is Hong Kong’s first female chief executive and will be making her first visit to Japan since taking office. Lam will also be the main speaker at a seminar about female empowerment. In recent years, Hong Kong has been developing an international reputation as a leader in terms of visual art, design and architecture. In line with this, Hong Kong Week will feature an exhibition of works that represent the unique characteristics of Hong Kong architecture. Other events scheduled over Hong Kong Week include a business symposium, tourism exhibition, movie screening, joint performance by young musicians from Hong Kong and Japan and a unique fashion exhibition featuring modern interpretations of the iconic Hong Kong cheongsam (one-piece dresses that were particularly popular between the 1930s and 1970s). According to Yung, Japanese tourists are becoming increasingly sophisticated in their tourism choices when they come to Hong Kong, wanting more than just shopping. “They now also want to see traditional aspects of our culture and natural areas. In fact, 40 percent or more of our land is designated as country parks and nature preserves,” she pointed out. Clearly, Hong Kong residents are returning the love shown by Japanese tourists. “According to a survey, over 20 percent of Hong Kong visitors to Japan have been to Japan 10 times or more. Visitors from Hong Kong are the fourth-largest source of overseas tourists coming to Japan,” Yung said. “I really think Japan and Hong Kong have lots to offer each other. It would be wonderful if we can continue to build on this very special relationship,” she said with a smile. The website for Hong Kong Week www.hongkongweek2018.com will be launched Oct. 5. Shirley Yung earned her bachelor’s degree in social sciences from the University of Hong Kong and then a bachelor’s degree in law from the University of London, both with honors. She went on to further tertiary studies at the University of Oxford and the Harvard Business School. 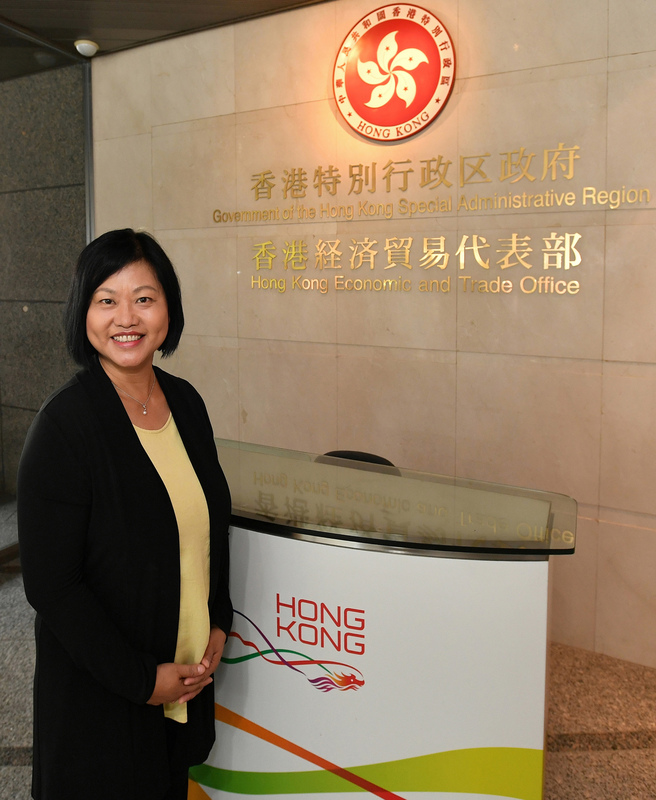 Since beginning her career in public administration in 1989, she has held various roles in the Hong Kong government, including the post of deputy director-general at the Hong Kong Economic and Trade Office in Washington, D.C., between 1999 and 2003. Prior to coming to Japan in 2016, she was Hong Kong’s deputy secretary for security for six years. When time permits, she enjoys traveling and has been to 39 of Japan’s prefectures so far. Her goal is to visit all 47 before she leaves. Yung cites respect for others as the key principle that has guided her career, helping her to build relationships both professionally and personally.